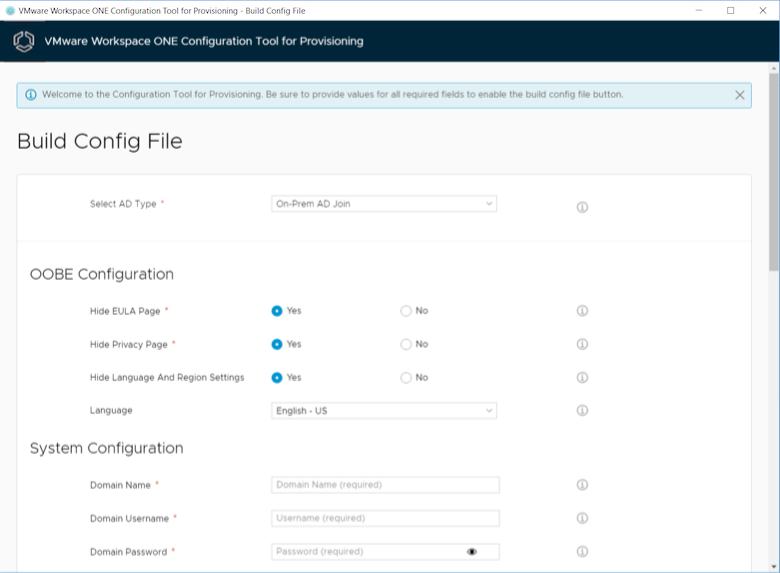 It's a stand-alone .exe app that helps IT administrators configure general and Out-of-the-Box Experience Windows setups to automatically enroll users in Workspace ONE. The User Interface has dynamic and efficient validations in Clarity and Angular, preventing the user from building the unattend.xml until all the validations are correctly satisfied. This makes the UI fool-proof and reduces the chances of generating an invalid xml file. Split the locale settings into 'Operating System Language', and 'Region and Keyboard Settings'. Removed the ability to set a custom computer name. The computer name now defaults to '*', which causes the Windows OS to generate a random name, taking up to seven characters from the 'Registered Organization' field plus eight random characters. This change makes sure every computer has a unique name on the network. The 'Auto Admin Logon' feature is no longer selectable. Instead, it will be activated when it is required by the deployment scenario.